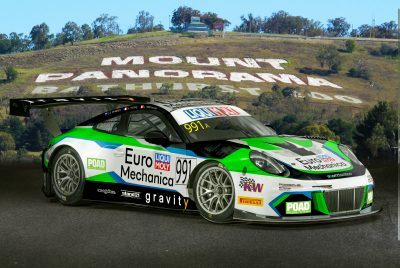 EuroMechanica joins Craft-Bamboo Racing as title sponsor for the #991 Porsche 911 GT3 R and will be challenging for glory in this weekend’s Bathurst 12 Hour with an all Porsche factory driver line-up. The team is hoping to score Porsche Motorsport’s first endurance win of the 2018 season by defeating a 53-strong field on one of the most gruelling stretches of street circuit on the planet. Running a full factory driver line-up consisting of GT superstars, Kevin Estre, Laurens Vanthoor and Earl Bamber, the trio will pilot the EuroMechanica backed #991 Porsche 911 GT3 R against 29 GT3 rivals fielded by the biggest marques in GT racing. Thanks to the depth of talent on offer from Vanthoor, Estre and Bamber, the three drivers have a very strong chance of besting the competition and capturing the top step of the podium. Supported by Porsche Motorsport Asia Pacific, the Hong Kong based outfit is well prepared to tackle the 12 Hour endurance race and aim to kick off their season with a major GT victory. The Bathurst 12 Hour presents a variety of challenges for the drivers though, with huge elevation changes, devastating concrete walls and a lengthy 6.2km layout that features high-speed straights, a flowing mid-section and a snaking series of esses, all designed to push a driver and their car to the limits. The three world class drivers will have to contest each stint flawlessly and stay out of trouble if they are to clinch victory this weekend but thankfully they are not short on experience at ‘The Mountain’. With pole-positions, podiums, class wins and multiple years of competition at the Bathurst 12 Hour between them, Craft-Bamboo and the EuroMechanica Porsche 911 GT3 R are set to take the fight to the best GT drivers and teams this Sunday and hope to come out on top. Title sponsored by Australia’s largest network of European specialist workshops, EuroMechanica, the #991 Porsche 911 GT3 R brings back the angular green, white, blue and black livery made famous by the team during their third-place podium finish at Bathurst in 2015. EuroMechanica is Australia’s largest network of European specialist workshops. If you care about your car, you probably want to take it to a mechanic that cares too. Someone who only uses Liqui-Moly lubricants and specialises in your type of vehicle. Someone who really knows what they’re doing and wont rip you off. So for service & repair, problem solving or performance enhancements that standout mechanic is likely to be a EuroMechanica partner. You’ll love taking your car there. “The team are really motivated for the Bathurst 12 Hour this weekend; all the planning is complete, so it is now down to the execution. All three drivers are well prepared for the challenge ahead and are familiar with both the car as well as the circuit, so we have a strong package here in Bathurst. We are pleased to have the support of EuroMechanica this weekend, which we hope will create some buzz amongst the Australian fans, so all in all, really looking forward to a solid weekend of racing.